Manhattan Medicine Co., 1¢ black, trial color large die proof, on India, stamp size with wide even margins, fresh and Very Fine. Manhattan Medicine Co., 1¢ green, trial color large die proof, two in blue (stamp size) and in green (38x62mm), on India, blue proof with small thin at top left, otherwise Very Fine. 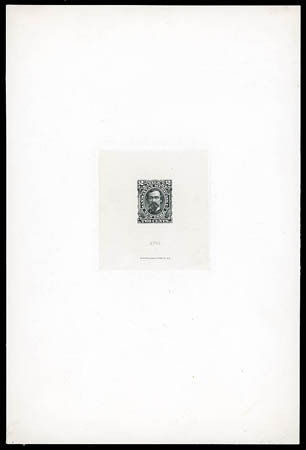 Manhattan Medicine Co., 2¢ black, essay, similar to issued stamp without top and bottom labels, on India die sunk on full card (150x224mm), with "4721" number and N.B.N.Co. imprint below, bright and fresh, Very Fine and rare. Scott No. RS172E Estimate $300 - 400. 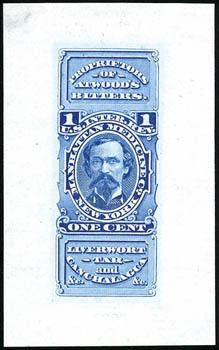 Manhattan Medicine Co., 2¢ trial color large die proofs, two in blue and green, on India, stamp size with ample to large margins, bright and fresh, Very Fine. 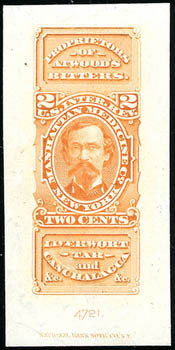 Manhattan Medicine Co., 2¢ orange, trial color large die proof, on India mounted on card (28x57mm), with "4721" die number and NBN Co. imprint at bottom, strong bright color, Very Fine.